Introducing children to calming practices at a young age can be really beneficial in the long run. Children can meditate just like adults only the expectations need to be different. Children have shorter attention spans and that is why it is important to guide them in 3 to 10 minute meditations. 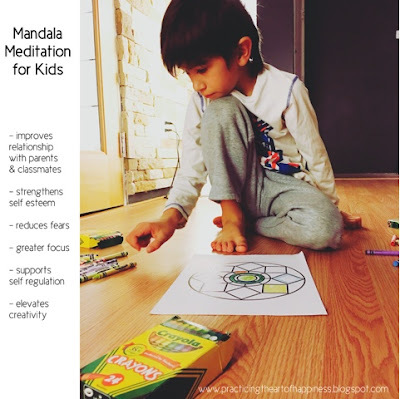 A mandala meditation can help focus a child's attention span for much longer because it involves movement, creativity and art. A mandala is a circle containing repetitive designs or patterns symbolizing wholeness, which help create a sense of tranquility. Anyone can create their own Mandala focusing on a particular theme and use words, images or colors to represent it. - Improves relationship with parents and class mates. 1. Take out a blank piece of paper and use pencils, crayons and markers to create your own. It doesn't matter how it looks, it's much more about the experience of making one. 2. Purchase a mandala coloring book and color in it. These days they have large sections filled with mandala coloring books at Barnes and Noble and even at Target. 3. If you are in nature, you can use items in nature to make one. Walk around for a few minutes and pick up rocks, leaves, sticks, etc. Use those items to create a mandala with your child or children. My son and the children I teach meditation to seem to really enjoy the combination of art and meditation and can meditate up to 20 minutes at a time. Believe me, even I am surprised at times at how much they can calm and center themselves. Try it a few times and please share with me your experiences with this practice. Thank you for informative & really needed post.